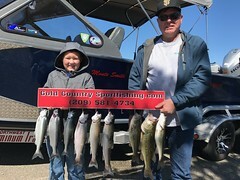 New client Martin Moore was out visiting California all the way from Switzerland, he booked a trip with me for he and his son for a days fishing and relaxing. It had been several months since id been their. 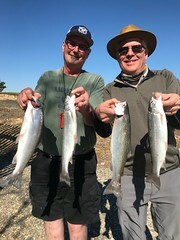 We headed out and after setting four rods rigged with various spoons at all different depths, it wasn’t long before we had our first fish on, I found a spot where the fish were and by the end of the day the boated eight rainbows a small king salmon and a bass from the waters of lake Don Pedro. They kept seven trout for the dinner table. 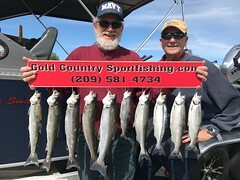 Thanks for fishing with Gold Country Sportfishing! !